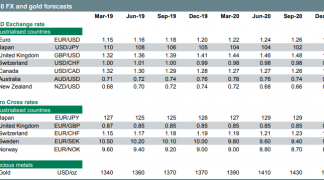 Foreign exchange strategists are digesting news the UK has been offered a Brexit extension until October 31 and considering the delay's implication for the British Pound over coming months. One investment bank has told clients the delay has prompted them to downgrade their forecasts for the Pound against the Euro. The Pound's initial reaction to news of an extension to October 31 was a shrug of the shoulders with the currency seen trading tight ranges against both the U.S. Dollar and Euro through the hours following the announcement. "A delay was anticipated. Last week European Commission President Tusk signalled his preference for a flexible delay of up to 12 months, so some investors may have been disappointed with the news that the Brexit deadline is now October 31," says Foley. In line with expectations, the UK will able to leave the EU as soon as a deal is agreed by the UK parliament. If the UK Parliament hasn’t decided to exit the EU before the end of the third week of May, it will have to participate in EU elections. 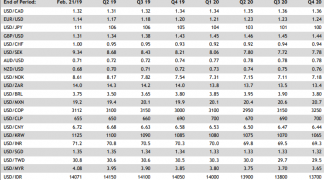 "Another key reason for GBP’s lacklustre response is that yesterday’s delay serves only to kick the can down the road. The UK has now been saddled with a prolonged period of uncertainty which is likely to exacerbate the pressure on the economy and in particular the profitability of exporters," says Foley. 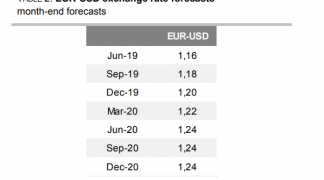 Rabobank have revised lower their forecasts for Sterling, and now look for a move in the Pound-to-Euro exchange rate 1.19 in 6 months time, down from a previous forecast of 1.22. 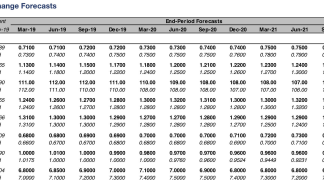 The target set by Rabobank does imply some upside from the current 1.16s we are seeing, so there still might be something in this view for those watching to transfer pounds into euros over coming weeks. We would however expect some trigger to generate the moves, and would imagine that a breakthrough in Conservative-Labour cross-party talks would be one such trigger as it suggests potential for a Brexit deal finally being ratified. However we believe that with the Brexit deadline having been lifted, so too has the pressure on both sides to strike a deal. We would imagine that any serious breakthrough would only be forthcoming towards the October 31 deadline. However, the outlook is an uncertain one with a risk that Prime Minister Theresa May ultimately resigns in the face of a deeply unhappy and divided Conservative party. want to get rid of Theresa May." While Conservative Party rules say there cannot be another no confidence vote in May's party leadership until December, the leaders of the Conservative backbenchers (the 1922 Committee) decided yesterday they will try to persuade May to quit soon. "A bad local election on 2 May or bad European elections on 23 May may be what is needed to force Theresa May out," says Milhøj. The leadership selection process could ultimately be a lengthy one as there is no obvious successor, but we would imagine the Conservative's rank-and-file would almost certainly install a Brexiteer who would be willing to take the UK into a 'no deal' Brexit. But, this turn of events opens the door to a general election on the basis a new Brexiteer leader would face resignations from a number of the party's pro-European MPs, leaving the successor with no majority in parliament. "Investors are well aware that the next 6 months could provide various twists and turns both for the Brexit process and for UK politics. It is not out of the question that a general election will take place this year and that this could yield a hung parliament which could provide an opportunity for Labour’s Corbyn to form a coalition government," says Foley. We get the sense that the risks to the GBP/EUR forecast of 1.19 are to the downside. Foreign exchange analysts at a leading Scandinavian lender have told clients they are lowering their forecasts on the British Pound.